Who Won Audiences in the Super Bowl? The Sleeper Bowl this year didn’t exactly draw a crowd, with one of the smallest audiences in more than a decade. Only 16% of American households watched the Rams vs. Patriots game on CBS, according to viewership data from Inscape, the TV data company with glass-level insights from a panel of more than 10 million smart TVs and devices. 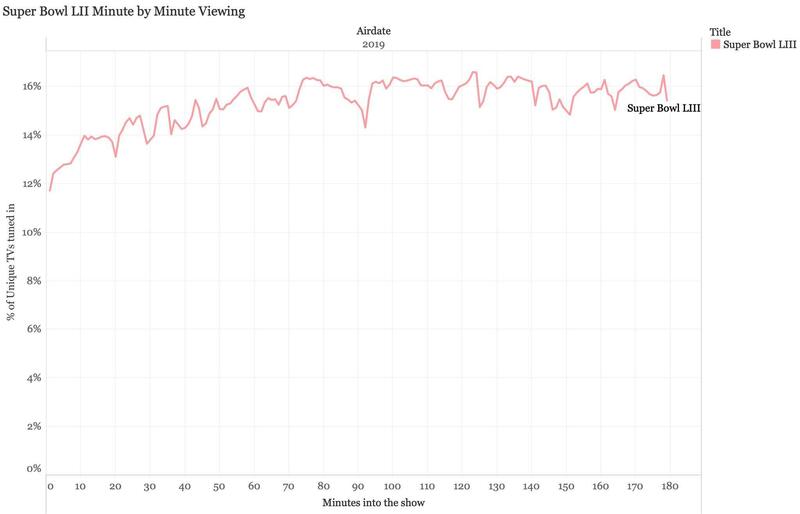 The minute-by-minute viewership data from Inscape (below) demonstrates that tune-in rose gradually during the first part of the game and leveled off in the second half. What set the mood for the Big Game? 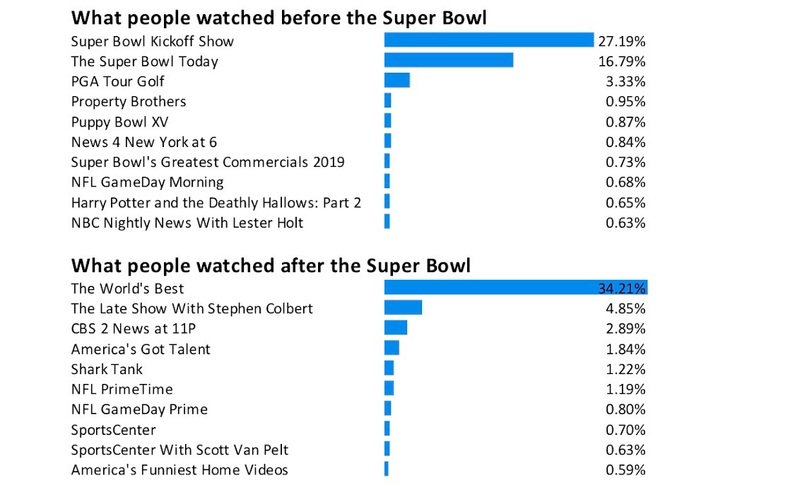 Inscape data reveals what America was watching before the game: the Super Bowl Kickoff Show (>27%) and Super Bowl Today (>16%) dominated pre-show viewership. Following the game, a majority of audiences tuned into The World’s Best, a new reality competition show that premiered after the Super Bowl. We also took a look at viewership in Atlanta and New Orleans. A lower % in New Orleans watched the Super Bowl this year versus last year – given the refereeing call, and to a lesser degree, the “Taking a Knee Boycott.” In Atlanta, the % of viewers increased, given that Atlanta hosted. The data is collected from all sizes and makes of TVs and is spread across all DMAs in the U.S, making it representative. Inscape delivers data on a second-by-second basis in raw form so the data can be used in a variety of ways and its fidelity can be verified quite simply.